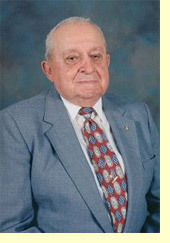 Euda Delcambre was the first sheriff to serve 20 years in Vermilion Parish. He is considered the last of a breed of Cajun lawmen to rule Vermilion Parish and he did it with finesse. Delcambre was born July 20, 1915, in the countryside of Delcambre-Erath. With his father blind, it became necessary for him to quit school in order to help support the family. Delcambre remembers working at the Jefferson Island Salt Mine at the rate of ten cents per hour. He was one of the many young Cajuns boys who began school only speaking French. As a child he would sing and yodel in French while riding the mule driven school bus, which distracted the mules and brought them to a halt. The teacher was so annoyed with Delcambre for stopping the school bus that she had him sent to the principal's office. As a punishment, he had to walk to school while his friends rode the "mule bus." In 1942, he volunteered in the Army to serve his country and was transferred to Hawaii and went on to serve in the 33rd Infantry Division in combat in the Philippines. Delcambre began his political career early. When the village of Delcambre's population became sufficient to be incorporated as a village, he was appointed by the governor, first, as a City Council member then mayor. After that he ran for mayor twice and won easily both times. Delcambre developed an uncanny knowledge of the electorate, say local politicians. He built his power based on jobs, public contracts, favors, and a kind of personalized law enforcement that some believe isn't possible, or acceptable anymore. Delcambre pulled the upset of his lifetime in 1964 when he defeated Vermilion Sheriff O.V. Jack Moss. No one man could have defeated Moss at that time. Delcambre, while still mayor, began campaigning a year early in 1963 for office of sheriff. When Delcambre made the runoff he received the support and endorsement of all seven losers from the first primary. It was a sly political move that Delcambre convinced all of the losing candidates that if they would unite as one, it could help him defeat Moss. He offered all seven of them jobs and although only three accepted, his plan worked. With their unilateral support, he defeated veteran incumbent Jack Moss by over 3500 votes and was sworn in as the new sheriff May 1, 1964.. He remained in that same office until 1984 when he officially retired. Known to many as "Uncle U." Delcambre developed a popular youth sports program whereby the Sheriff's office sponsored as many as 60 little league teams. Many residents of Vermilion still treasure the glossy photo of their child's baseball team pictured, of course, with the sheriff. It was under his administration that the new jail in rural Vermilion Parish was built. He also, in his younger years, operated a crew boat business with his brother, Loleste,. Today, Delcambre likes to entertain friends at his camp on Highway 89. He loves playing dominos and bourre' and can be found frequently with family and friends cooking his famous etouffee.